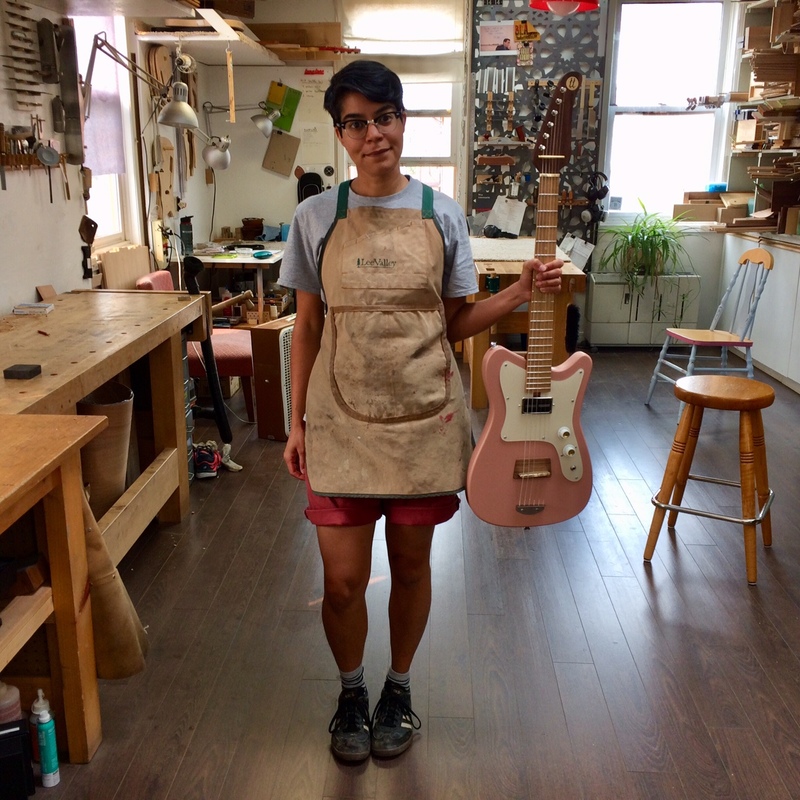 Leila Sidi’s journey to guitar building began in an unlikely place. Bicycles. “Working on bikes empowered me.” Volunteering at a local bike co-op in Edmonton, Alberta made her realize that there things she could do that she hadn’t previously thought possible. Eventually, Brad left their shared workspace, but Leila wanted to stay. So she talked to the other tennant, Dion James of Dion Guitars about a mentorship. He agreed, and she began working on a copy of a friend’s Fender Musicmaster bass, the short-scale bass guitar (there’s also a six string guitar version) originally intended for students and children. It took a year, but Leila finished her Musicmaster copy with help from Dion. Next up for Leila were original designs. 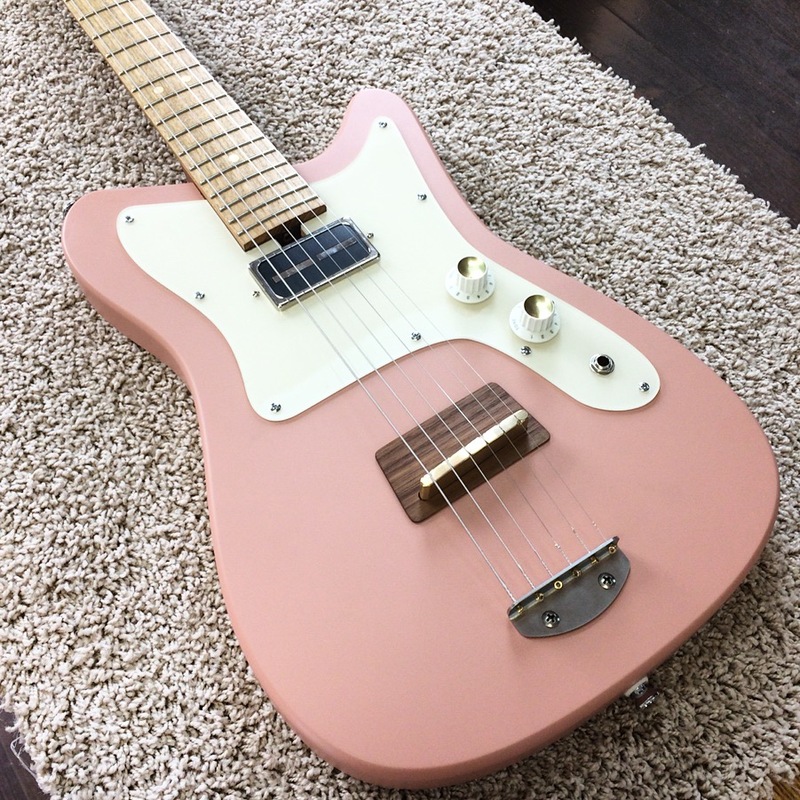 She built a baritone guitar for Dion as a gift (she’s currently working on another one), but she got right back to what she wanted to build: high quality, short-scale guitars that are comfortable for smaller players. Her design is inspired by her love of mid-century modern instruments. “I don’t play the guitar, so I don’t have a relationship to the nostalgia and the sort of attachment to vintage factory instruments that many musicians do, like to a ‘62 Telecaster. It’s not part of the culture that I’ve been a part of.” Building Tele- or Strat-style guitars never appealed to her in that respect. Instead, she looked to both the furniture she’d been building with Brad as well as guitars sold in catalogs from the ‘50s and ‘60s. “I started to think about the reason people love these instruments currently, despite that they’re not perfectly intonated or that they are certain imperfect instruments and they don’t have a classic kind of tone like a Strat or a Tele and I think the reason people love those instruments is that they sound unique.” And, despite not being a musician herself, she realized through watching friends try different guitars in local shops that players adjust their playing based on what guitar they were holding. It made her realize that guitars themselves – how that look and how they sound – can inspire the music. With that in mind, Leila set out to build from a similar position. Instead of using exotic woods often popular in guitar building, she uses wood from trees that grow more locally and abundantly so that harvesting them isn’t a threat. She sources hardware locally whenever possible. Edmonton is known for being an industrial town in an industrial province, and she takes advantage of that industry by manufacturing parts that come from local sources and are made locally, and tries to make as much in house as possible. That includes her neck plate and bridge, which are both original designs.